Skirt: PINE. Tshirt, Turban & Boots: ASOS. Cardigan: TopShop. Tights: American Apparel. Bag: Chanel. I got a lot of emails asking about the Stilla creme blusher I posted about here. You guys couldn't find it anywhere because the brand had been discontinued... I've found the next best thing! 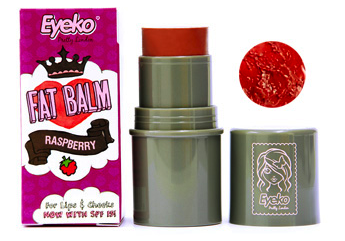 Eyeko sent me their new 'Fat Balm' in Raspberry and it is gorgeous! I kinda want them all now. I'm wearing it in these pictures. It gives a lovely natural glow, goes on very smooth AND you can use it on your lips! I've been perusing their site and Im veeeeeeery tempted by the black graffiti pen. It would be great for my winged eyeliner look, no? They're offering free shipping at the moment in case any of you fancy getting a 'fat balm' of your own!